I’m without a commission at the moment, so I’ve been pushing into “what if” territory in oil paint. I’ve played with three paintings, all handled differently. The subject is the same, though posture and expression vary greatly. Above is the first. I applied many more layers of glaze than I normally use, to see if my usual technique could improve with the added work, or if the result would just become too noodley. The later is the final verdict. The dozen layers or more of paint simply created thicker clumsy strokes. The painting does however, look better in reality. Photographing the painting sans the shine was a bear. The translucent quality resulting from multiple glazes isn’t apparent in the photo, and the transitions between values aren’t showing up well, resulting in annoying linear areas. wow. i especially loved both of these portraitis.. they’re stunners! I know what you mean. Digital work solves a lot of practical problems. Thank you Alan! This one has a level of eeriness as well. It is so compelling! I almost expect her eyes to shift away from me. I love it! Your gift with words is apparent in this comment:) Thank you Troy. I feel the same about your writing. Stunning portrait, Elena. You are so talented. Elena, wow you are so good! I’m mean seriously a master. I saw your #2 first which was brilliant. This #1 is an awesome piece of work. The mood seems darker, her expression more mysterious – the colors used for her skin texture and tones are beautiful combinations, and those eyes are superb. Her hair has got gorgeous slices of color weaved together. It’s such a pleasure to see your portraits – I love them. You are so kind Mary. Thank you very much! 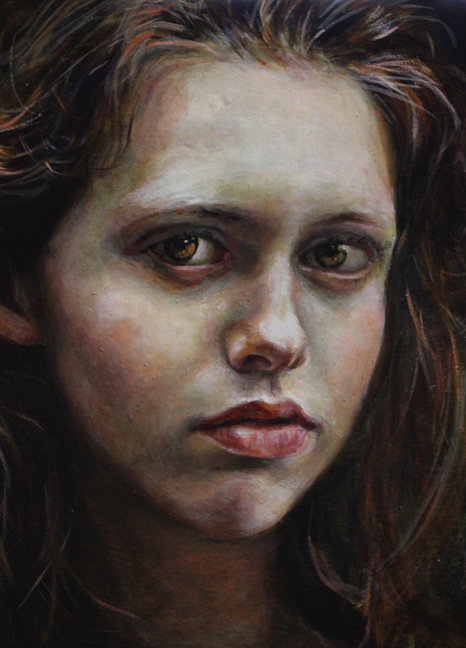 A lovely painting Elena – it has a compelling quality which keeps bringing me back to it. Very intense gaze . and the light … what a wonderful painting you have done here Elena . I was immediately hooked by this portrait – the intensity of the sitter, the life in the eyes, the set of the lips, the modelling of the features, the texture of the hair – and yet in places there seems to be a somewhat ‘powdery’ quality. Since I have no expertise whatsoever in painting I am reluctant to comment. maybe this is evidence of your ‘experimenting’. Whatever, as a portrait I like it, a lot!! Thanks very much Louis! And yes, the powdery texture is caused by my inexpert photography and the places where the paint is heaviest and the glaze medium is sitting thinly on top of the paint. This is absolutely amazing Elena! She’s almost talking with her shining eyes, so beautiful, so alive! Love how you’re sharing the process with us! Can’t wait to see more! NICE! Ya ever think of taking it further with a Rembrandt-type of style? You’re almost there with the dark hair and background. You are quite a good portrait artist. Yes! That was my initial intention-you know, Rembrant in his last years with all that thick paint-but I didn’t in the end, didn’t go dark enough. Thanks Hansi! I love it, it is beautiful, You managed to capture remarkable detail. The thing that caught my attention the most is the eyes, they have a warm organic feel to them. Really wonderful, Elena. So expressive! One of the best oils I’ve seen in a long time. Fantastic expression in the eyes captured brilliantly, great stuff! I could see yiu working…. This is beautiful! You have been holding out on us!! I love this Elena.. the tonal quality and expression are both superb. Too kind Helen. Thank you. Oh, that is very well done, Elena!!! Art is so hard to photograph, isn’t it?! Especially textured like oil painting! However your technique is apparent and this one looks beautiful! Splendid! You created a splendid portrait, dear Elena, so expressive with unique special color! Congratulations! Congratulations! You have a fantastic talent! Thank you very much for sharing with us! Beautiful Elena, I love the light on her face which you notice first and then the highlights and texture of her hair, I wish my experiments turned out so well…. I like the warm rusty colors in eyes and hair contrasting to the cold blue and green skin colors. Nice! Sei troppo dura con te stessa…il tuo lavoro è veramente bello!!!! Fascinating to see you work in a different medium. While I get what you’re saying, I think there’s a real luminescence to the portrait and some nice subtlety. Looking forward to seeing #2. Thanks Richard for your insights, much appreciated! She is so alive! Love that quiet, moody intensity! Elena, this is amazing to say the least. The different colour tones, the dark ones around the eyes create a three dimensional effect. Great work! Your best work yet, Elena. I love the tones and textures of her skin. Very expressive; really good work! This is the Master piece. illuminates evenly and make it flat. = need to use many spot lights. Even in the National Portrait Gallery in London, a portrait in this quality are not many. Very well done Elena ! I’m such an amateur photographer that I lack the equipment and patience to shoot it right. Thank you for your kindness Yoshi:) And as always, thanks for your support! Yup, though pushing through comfortable territory into rockier terrain. Thank you John! experiments? wow, then when you decide you aren’t experimenting anymore we are all in for a real treat. This is stunningly beautiful! Truly incredible work Elena. Her animate eyes are mesmerizing, glassy, striking features overall. She is sculpted into life with your paintbrush, Elena. Fantastic work. Wow! Oils! She looks totally alive. Well, alive but a bit ghostly (maybe because of the greens?) Very stunning and beautiful work, all those facial features are perfect.